Help, My Child Doesn’t Want to Eat What I Make! 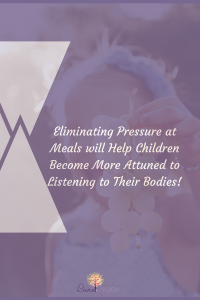 Eliminating pressure around meal and snack times, will help your children to become more attuned to listening to their bodies and eating for hunger and stopping when they are full. As parents, this is difficult to follow through with at times because we want what is best for our children. We want them grow up to be healthy and happy. However, what most parents don’t realize is the more pressure we put on our children to eat, the less well they will actually do in the long run. You might be thinking, but if I don’t pressure them to eat, they won’t eat their vegetables anymore. Or, you might feel like all they will survive on is snacks or sweet type foods. You might even feel sometimes your children are surviving on air and not eating much at all. It can be very scary for a parent who only wants the best for their children. Here is what I’ve learned both through the work I do as a nutrition therapist and a mom. Children’s eating is erratic and that is normal. Yes, one day they will eat lots of food and other day they will only eat a small amount. However, what I know is if we can’t give up some of the control and give them some autonomy around their eating it will interfere with them developing a good relationship with food as they get older. How we feed our children and what they eat is not really about today, tomorrow, or even next year, it really looks at how will they eat for the rest of their life. And what I know is if are pressuring them it won’t result in long standing changes – only temporary changes! I get it – just last night I spent time getting dinner prepped and on the table. My daughter took a few bites of each thing and told me she didn’t like any of them. Defeated is an understatement. When I stepped back to check in with my own feelings around the situation I was able to realize it really had little to do with me, but rather, she wasn’t feeling well. It made perfect sense, of course it doesn’t taste good to her – her taste buds are really not great right now from being sick. So while it’s easy to feel insulted as a parent when our children don’t eat a meal well look at the bigger picture. It’s our job as the parents to get the meal on the table and it’s their job to eat it. Things will go much different if you try to interfere with their eating. Pressure comes in all forms when you are feeding children. Have you said any of things? Just take two more bites.. I think you have had enough of …. eat more …. No, you can’t have anymore …. You don’t even have to say anything for your child to feel pressure either, it could be in what you are doing too. 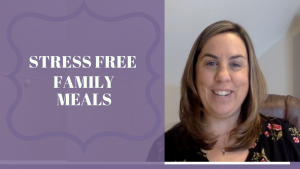 Making special meals for your children? Plating the food on their plate for them without asking what they want? Touching their plate while they are eating or moving around food on their plate? 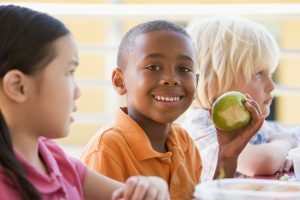 While as parents, we always have good intentions children will do less well with eating when they feel pressure around eating. Instead, try pressure free meals and snacks with children. Believe me it’s no easy task to stop pressuring your children if you have been doing it for a long time, but it will be well worth it so your children will learn to grow up as life long good eaters. Here are some ways you can start out by having less pressure around meals and snacks. If you are struggling around pleasant conversations, here are some great resources to get your started. 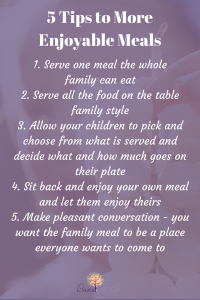 When we are anxious about family meals our children can pick up on anxiousness and often they feel anxious also. This leads to doing less well at meals and can effect them growing and eating well. Give it a try, what is one way you can have less pressure at your next family meal? Check out my You Tube Video on this very topic!